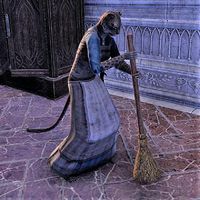 Araitha is a Khajiit servant sweeping the second floor of the Mages Guild guildhall in Shimmerene. She has no unique dialogue. This page was last modified on 27 May 2018, at 22:30.